One claim the anti-vaccine lobby use in their attack against the efficacy of the pertussis vaccine is the high uptake rate. The logic being that with high uptake and proper vaccine efficacy, pertussis should be better controlled than it is. In fact completely controlled. Thus the pertussis vaccine is a failure. Whilst the vaccine may not provide impervious protection, infection of those vaccinated is much less common and markedly less severe. In a household where someone has whooping cough, an estimated 80-90% of the unimmunised contacts of that person will acquire the disease. These realities won’t shift committed antivaccinationists. 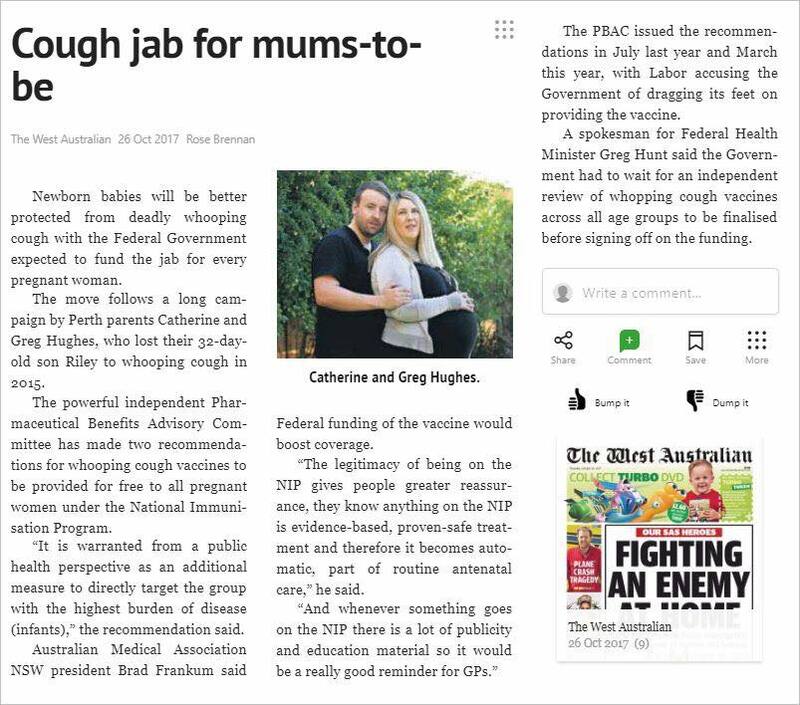 They will be convinced by the terribly misleading claim above, using unrelated figures on SIDS and pertussis vaccination. I find it astonishing anyone could be swayed by it. Yet for readers unskilled in finding reputable information or not prone to checking alarming claims it has an intuitive ring of causality. ♣ Infants receive vaccine doses at two, four and six months of age. 90% of SIDS cases occur in the first six months of life, and most of these in the first three months. The risk decreases consistently. After twelve months babies are by definition not infants and the risk of Sudden Unexplained Death is significantly reduced. So the claim above merely sounds plausible because infants are most at risk of SIDS up to six months. Over this time they have three pertussis vaccines. The vast majority of children in developed nations will follow the pertussis vaccination schedule. SIDS and Kids is an Australian organisation that supports educating the public about the “significantly” reduced risk of SIDS that accompanies immunisation. They have also noted that when the age of first immunisation was lowered by four weeks there was no lowering of the average age of SIDS. A constant assertion from the anti-vaccine lobby is that of “too many, too soon”, contending that modern vaccine schedules overwhelm infants and children in a manner yet to be uncovered. 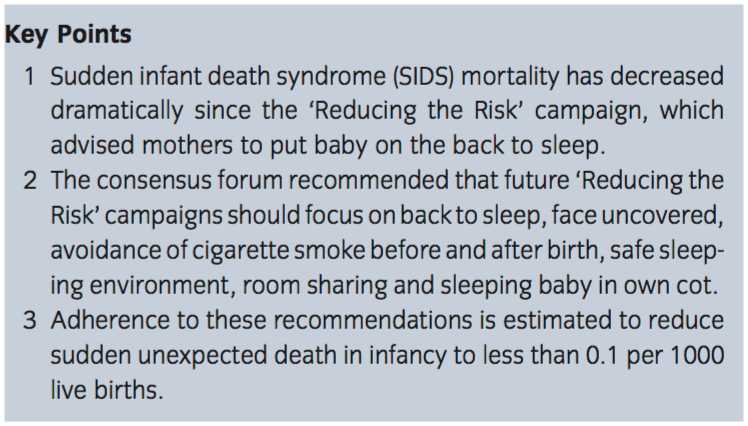 An earlier study by Vennemann et al, Sudden infant death syndrome: No increased risk after immunisation found no evidence for this but rather the opposite. A number of studies have been conducted in Australasia, North America and Europe. 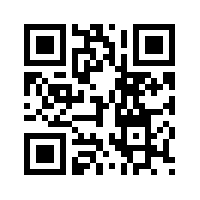 All confirm that immunisation is not causally linked to SIDS. Thus early immunisation is coincidental to the age at which SIDS is most likely. In fact the reverse is true with respect to causality. SIDS cases are less likely to be immunised or fully immunised. Unlike most “vaccine injuries” this favourite fear tactic of antivaccinationists does have an origin in a published report. Further examination of the vaccination histories of infants who died suddenly has revealed no additional instances of vaccination within 24 hours before death. Thus, 4 deaths have been found that occurred within 24 hours after receipt of vaccine from Lot No. 64201, compared with no deaths within 24 hours after DTP vaccination in the earlier 8-month period in Tennessee. All controlled studies that have compared immunized versus nonimmunized children (Table 5-1) have found either no association (Bouvier-Colle et al., 1989; Pollock et al., 1984; Taylor and Emery, 1982) or a decreased risk (Hoffman et al., 1987; Walker et al., 1987) of SIDS among immunized children. One small controlled study of infants with unexplained apnea, who may be at increased risk for SIDS, demonstrated improvement in ventilatory patterns following DPT immunization (Keens et al., 1985). The evidence does not indicate a causal relation between DPT vaccine and SIDS. Studies showing a temporal relation between these events are consistent with the expected occurrence of SIDS over the age range in which DPT immunization typically occurs. It’s important to note that at this stage no research demonstrating a reduction in SIDS due to immunisation had been published. Consequently the authors do not mention this effect. In 1995 E.A. 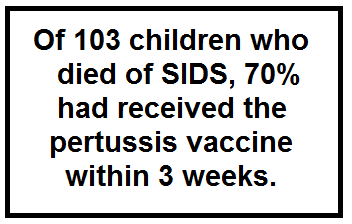 Mitchell et al examined the association between immunisation and SIDS. They observed there is no increased risk of SIDS following the Hepatitis B immunisation or the 6 week DTP immunisation. They also noted early studies suggesting an increased risk of SIDS with immunisation had no control data. Two studies with controls that suggested such a temporal link demonstrated methodological bias. Immunisation does not increase the risk of SIDS and may even lower the risk. DTP immunisation is inversely associated with SIDS mortality on the population level. The current findings may strengthen parents’ confidence in the benefit of DTP immunisation, especially as they are supported by the results of two meta-analyses*. *See Vennemann et al, above. Parents are advised to immunise their babies according to the national vaccination schedule. The possibility of the DTP (diphtheria-tetanus-pertussis) vaccination being linked to SIDS has been discussed periodically over the last 20 years, however a series of studies have consistently refuted the association. A recent meta-analysis published provides strong evidence that immunisation is associated with a decreased risk of SIDS (OR 0.54; 95% CI = 0.39–0.76). We should note that the delightfully immoral antivactionist and author of Melanie’s Marvellous Measles, Stephanie Messenger was involved in peddling a long debunked “prevention” for SIDS. In fact SIDS and Kids have their own evidence based and comprehensive publication outlining why mattress wrapping offers no protection. A March 2003 article in Pediatric and Developmental Pathology, SIDS: Overview and Update offers evidence to debunk both the “mattress toxin” myth and proposed links to immunisation (p. 121). In 1989 in the UK Barry Richardson contended that the fungus Scopularis brevicaulis broke down fire retardant chemicals in mattresses or their PVC covers. This produced arsine, phosphine and stibine gases from antimony, phosphorous and arsenic. A UK study failed to replicate Richardson’s findings. A follow up study with Richardson’s collaboration also failed to duplicate the proposed findings. …there is no evidence to suggest that antimony or phosphorus containing compound used as fire retardant in PVC and other cot mattress materials are a cause of sudden infant death syndrome. Cot mattress contamination with the fungus S. brevicalis is rare, and no more common in SIDS mattresses than in other used mattresses. There is no evidence for the generation of gases from phosphorus, arsenic and antimony from cot mattresses, by S. brevecaulis, when tested using conditions relevant to a baby’s cot. (the group did, however, identify laboratory conditions, wholly unlike those that could occur in a baby’s cot, in which added antimony is biovolatilised, but to the much less toxic trimethylantimony and not to stibine). There is no evidence of poisoning by phosphine, arsine, or stibine (or bethylated derivatives) in babies who have died of SIDS. Low amounts of antimony can be detected in samples from the majority of live babies, and even newborn babies: the concentrations in the tissues of SIDS babies were not different from those dying from known causes. there are a number of sources of antimony in the domestic environment other than the fire retardant in cot mattress materials. We have found no evidence that the changing rates of sudden infant death correspond to the introduction and removal of antimony – and phosphorus – containing fire retardant in cot mattresses. SIDS and Kids also mention the conspiracy book Cot Death Cover-up? by N.Z. forensic chemist Jim Sprott. Stephanie Messenger also mentioned this book at her secret seminars wherein she peddled her “mattress covers” to protect against SIDS. 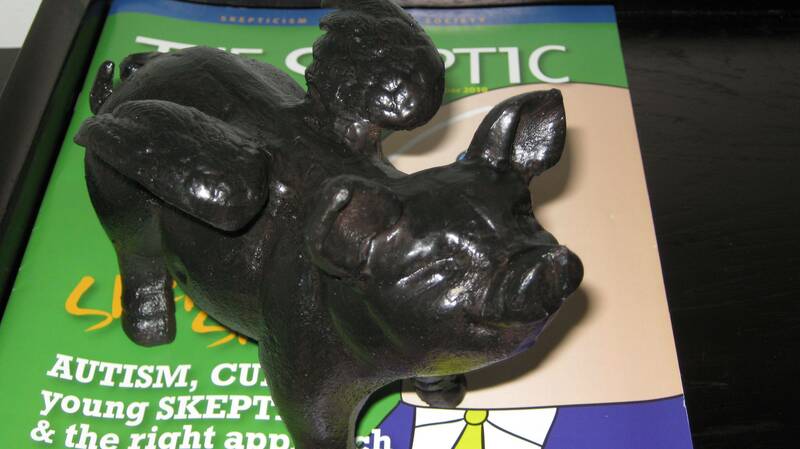 There is a fascinating February 2012 account of a conspiracy laden seminar on the Skeptimite blog. In April of this year it was reported that Messenger had the charity status of her “SIDS charity” Get Rid Of SIDS revoked. Just as well one feels. Not only because the scam had done no charity work and employed nobody. Messenger had gone from blaming vaccination for SIDS to pushing the phoney toxic gas theory as the cause – 20 years after it was first debunked and progressively relegated to conspiracy theory. When Messenger’s plan to bring the very harmful anti-vaccine heroine Sherri Tenpenny to Australia, she then advocated readers purchase her pro-measles book to help her out of debt. Ultimately nothing has changed with respect to the anti-vaccine claim that SIDS is caused by vaccines. In fact evidence supporting the opposite remains firm. We may also rest assured that mattress wrapping is an evidence free, conspiracy based waste of time.